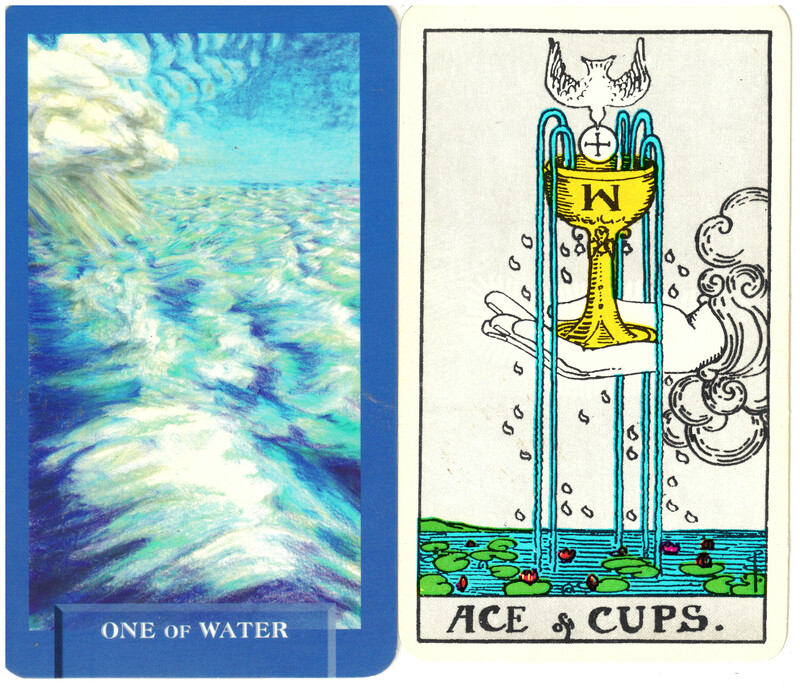 The element associated with the suit of Cups is water. Water represents the emotions on all levels from the highest devotion to the basest fears. The Ace of Cups shows a hand emerging from a cloud. It holds an overflowing cup or chalice. There are symbols on the cup and a white dove holding a communion wafer seems to be hovering above or about to dive in. This card symbolizes universal love, peace, wisdom and the spiritual gifts of life. It is almost always a favorable card. The aces from the Tarot suggest the ultimate of the attributes of the suit – in this case the attribute of unconditional, divine love. In Today’s Journey Tarot, the One of Water has no symbols – only the sea in all of its many aspects from calm to chaotic. The range of emotions is expressed by the diverse conditions of the water and these emotions will be exhibited within the suit. The One has been expanded to contain the entire emotional spectrum.